Electrical engineers in a medical research team discovered how acupuncture benefits sleep. They did it by measuring brain activity with EEG (electroencephalography) before, during and after an acupuncture treatment. Results were conclusive, acupuncture significantly increases slow wave activity of the brain relative to fast wave activity in both the frontal and central lobes. This phenomena is known to benefit the quality and duration of sleep. The acupuncture point used in this study increases the delta band power density, a known sleep related brain wave band. In addition, acupuncture at this point downregulates alpha and beta band activity relative to delta band activity. The decreases in these bands also enhances sleep quality. The researchers applied manual acupuncture to humans at acupoint ST36. It was found that this acupoint significantly increases the power ratio index of slow waves to fast waves following an acupuncture treatment. Stainless steel 0.2 mm diameter acupuncture needles were applied to the subjects. The needles were applied and retained for an initial two minutes followed by manual rotation of the needles applied for another two minutes. 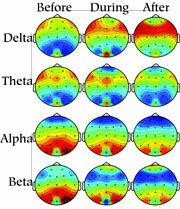 Measurements were taken throughout the brain of the delta (0 – 4 Hz), theta (4 – 8 Hz), alpha (8 – 13 Hz) and beta (13 – 30 Hz) bands. 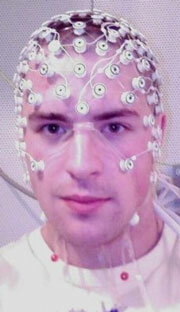 Notably, there were increases in the delta band power in five major brain areas during and after acupuncture. autoregressive spectral analysis. Yi Guo-Sheng, Wang Jiang, Deng Bin, Wei Xi-Le, and Han Chun-Xiao.